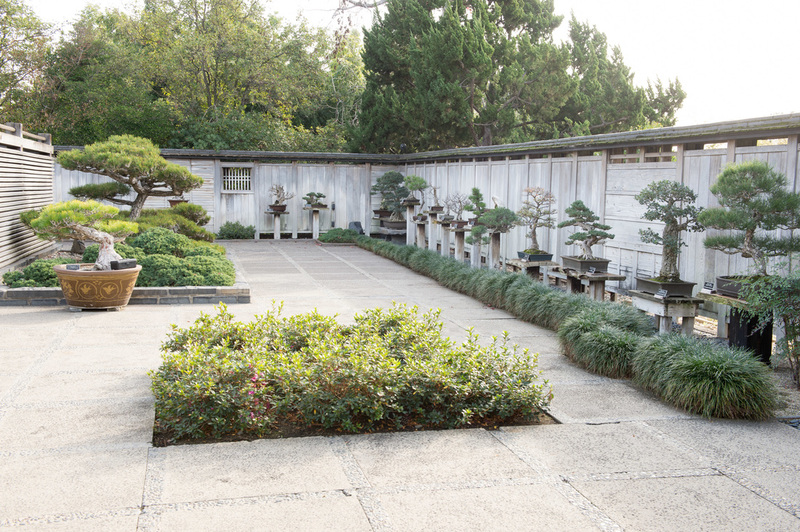 The Japanese Gardens at The Huntington were expanded in 1968 to include a bonsai court and Zen garden. In 1993, Golden State Bonsai Federation (GSBF) and The Huntington signed an understanding that GSBF would be allowed to move their bonsai collection to The Huntington, with the purpose of establishing a world class bonsai collection. With this move, an additional bonsai court and suiseki, or viewing stone area, was installed. Today the collection boasts over 400 trees from both collections. GSBF supplies bonsai volunteers to The Huntington to maintain the trees and bonsai garden specialists that work in the bonsai courts answering patrons and visitors questions on the first Thursday and Saturday of the month. There are two bonsai courts, the upper and lower. The lower bonsai court is entered by walking through the zen garden where you are greeted by a large selection bonsai on display. The ever changing display means no two visits to the bonsai courts will be the same. Displays are changed depending on season, blooming of plants, leaf color changes and fruit. All bonsai are displayed on wood pedestals against a natural wood fence to give the true feeling of nature. In between the two courts sits the Harry Hirao Suiseki Court. This is probably the only place in the garden where visitors are encouraged to touch the suiseki or viewing stones. The upper court has a water feature that adds to the serenity of the bonsai courts. Also featured is a memorial to Kay and Khan Komai in remembrance of their work, help and mentoring to the Southern California Bonsai Community. The upper court also houses the collection’s Shohin, which are bonsai that are eight inches or less in height. Housed in their own alcove across from the Komai Memorial Bench, it represents a perfect place to sit and listen to the water moving over the stones in the stream and enjoy the bonsai on display.